On 4 July 2015, the United Nations University Institute for the Advanced Study of Sustainability (UNU-IAS) Operating Unit Ishikawa/Kanazawa (OUIK) welcomed around 60 stakeholders to the first of its lectures exploring satoumi regions of the Noto Peninsula in Ishikawa Prefecture. The event titled Underwater Forest, a Cradle for Marine Life — the World of Seagrass and Seaweed in Nanao’s Satoumi which was held in Nanao City, aimed to explore the importance of seagrass and seaweed in conserving coastal marine ecosystems and sustaining local livelihoods. Noto Peninsula prides itself with a high number of satoyma and satoumi regions – socio-ecological production land- and seascapes respectively formed and developed through human interaction with nature – some of which are formally recognized by the United Nations Food and Agriculture Organization (FAO) as Globally Important Agricultural Heritage Systems (GIAHS). In the video introduction of Nanao’s marine ecosystem, Ms. Evonne Yiu of UNU-IAS OUIK explained that Noto’s satoumi, which are rich in seagrass and seaweed, fulfill an important role not only in providing habitats for living sea creatures, but also in regulating and maintaining productive marine environments. Moreover, Ms. Mikiko Nagai of UNU-IAS OUIK stressed that the socio-ecological interactions that have taken place in Noto for generations also serve as a source of traditional wisdom on sustainable use of marine resources – a potentially important contribution to the debate on strategies for achieving the new Sustainable Development Goals (SDGs). Subsequent guest speakers, Prof. Tetsuo Yanagi (Professor Emeritus, Kyushu University), Mr Takahiko Ikemori (Ishikawa Prefecture Fisheries Research Center) and Mr Hiroshi Kurtani (member of a fishing community in Notojima), introduced further examples of how different types of seagrass beds enrich marine ecosystems and support local livelihoods as well as concrete projects for recreation of seagrass beds. At the same time, the speakers expressed concerns about two distinct negative factors affecting seagrass beds: the rising seawater temperature which has detrimental effects on many species of seagrass; and the gradual decrease in the commercial value of seagrass and seaweed on the market, making commercial farming of these species less attractive. Both factors accelerate withering of large swaths of seagrass beds and subsequently lead to dropping numbers of fish. 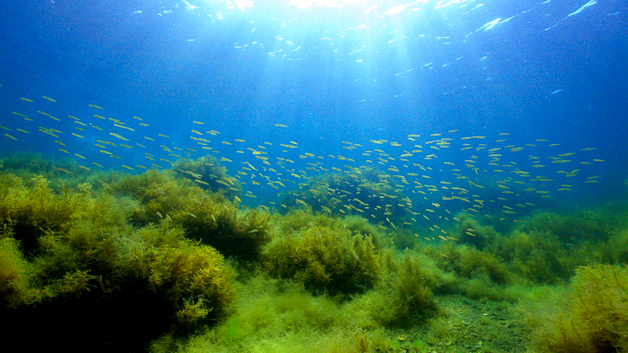 Multi-stakeholder efforts in protecting seagrass beds, which would include a dialogue on the interconnectedness of satoumi and satoyama, are therefore essential. The second event in the “Noto’s Satoumi Lecture Series” will be held on 29 August 2015 in Anamizu town, Ishikawa Prefecture.